Scenery: Mix of new Adeptus Titanicus, Old Epic Armaggedon and Bespoke. Gifted a new battle mat from Deepcut Studio for Christmas it was time to put it into action. I finished painting up some ruins and we organised the opposing sides into another matched play battle. 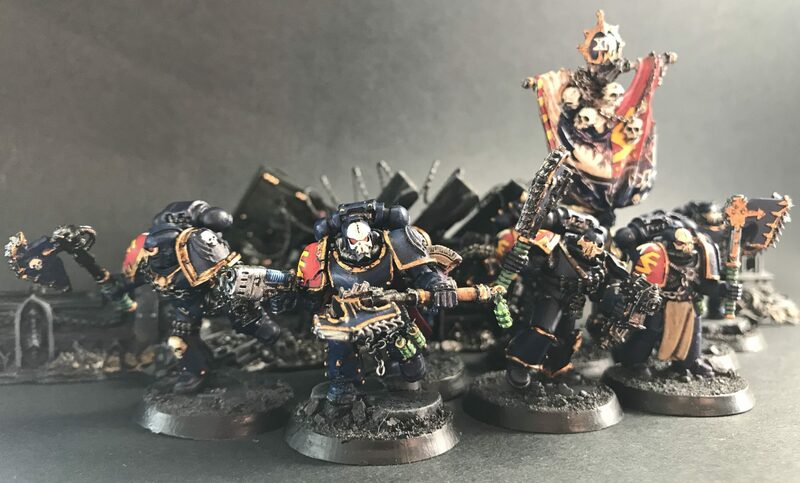 Two Warlords and a pair of Reavers on each side but rocking some different weaponry – paired laser blasters on one of each of the Warlords and a Powerfist on one of each of the Reavers. As the game started an advantage of the Dungeon theme battle mat became clear each of the squares is 1″ so the measurement ruler took a rest for most of the game. All the Reavers pushed their reactors to move into the centrefield ASAP. Opening salvos from the Traitors attempted to take down the Reaver approaching from the Loyalist left flank but despite focused firepower from the Laser blaster equipped Warlord and the Reaver failed to make a dent with the void shields still holding after the barrage. In contrast some effective dice rolling from the loyalist side saw the Warlord take a proper pasting, with the shields downed and some devastating hits pouring in from the Volcano cannons. On the other side of the battlefield some strong shields and poor shooting caused little damage and it was all recovered in the next repair phase. The split into two distinct channels of fighting on the board was unexpected and seemed to make almost two separate games, but this was about to change in the next turn. Having left one of the Traitor Warlords with no shields and a leaking reactor, the loyalist goliath turned to lay fire into the Reaver that had just entered combat. …but made little in the way of damage. The game was declared a draw after three rounds. There were no engine kills, but there was plenty of critical damage and another round could have been the deciding factor in swinging in favour of one faction. So Winters SEO has now completed a couple of battle reps and I was taken by his first game: Knights and Warhounds in a scouting units skirmish. I’d painted up some new terrain so we used that for this clash of the loyalist Legio Gryphonicus and House Coldshroud knights and the traitors of Legio Ulricon and House Liagaun. Two Warhounds and 6 knights apiece. The first movement round brought both sides within firing range and all of the traitor firepower ploughed into the knights. The loyalist Warhounds being obscured by the forest. The combined firepower reduced the loyalist knights to two within the first round of shooting. It was bad news for the goodies! The second battle round saw the Warhounds coming face to face as they punched through the trees. Whilst the House Liagaun knights pursued the remaining loyalists of their ilk who proved to be immensely resilient (poor dice rolls helped them). The third round saw the focused fire power of the loyalist Warhounds destroy a Legio Ulricon god machine. The legs suffered catastrophic damage and it fell silent but did not fall. A turn later focused firepower, targeted attacks and flanking manoeuvres took down a loyallist Warhound. The catastrophic body damage saw it turn, lay two salvos into its team mate and then fall crushing one of the knights instrumental to its toppling, a glancing blow to the team mate and on the way down it flattened some trees! The remaining rounds failed to make a significant impact in standings and the game ended with a remaining and smouldering Warhound on each side, but three traitor knights to none. A victory was claimed as the Legio Gryphonicus Warhound remaining fled. With the gift of a Deepcut Studio battle mat for my Birthday it was time to take games of Adeptus Titanicus up a notch. When I played the original 30 years ago I couldn’t imagine playing go a surface like this – carpets and the original polystyrene buildings were it – we had good fun adding in books and maybe a sheet for terrain effect… So for this game we were recreating some magic. The titans of Legio Ulricon and Legio Gryphonicus lined up once again, with the knights of House Liagaun and House Coldshroud moving at pace into the centre field. Warlords and Reavers opposed each other on the flanks and started tearing into each other. 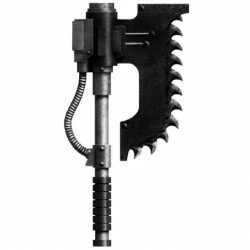 The loyalist Reaver missile launcher stripped off the shields from the opposing Reaver a fact that would not be reciprocated and prove critical. The traitor went on to suffer critical damage that could not be returned. With a leaking reactor things weren’t looking good for the traitors. Despite the tall buildings there was no hiding the towering mass of the Warlords and they too exchanged Salvos, both losing void shields but surviving complete collapse. The knights closed in to effective weapon range and started trading volleys down the central city valley. They never made it into close combat before the game ended prematurely and in the mean time the ion shields did a great job in protecting the Questoris. The Warlords also traded further volleys with stray rounds of volcano cannon fire turning the surround scenery to slag. The void shields however held strong. The game ended after three turns with an agreed draw. Looking forward to the next fight! Usual graphics, weathering and final detailing to follow. I was keen as mustard to get hands on these new Titan models and they are fantastic. Arrived Tuesday, magnetised and built by Friday. Time to get ready for paint! So no gaming mat but thanks to Warhammer 40k Conquest and a bit of card we have a basic gaming surface and plenty of buildings to get things underway. A Warlord and Reaver pairing from Legio Ulricon took on equivalent duo from Legio Gryphonicus. The small scale battle arena didn’t have a great influence on the game. It was our first go with the new rules and there was a bit of feeling out the gameplay. There was no winner or loser in the game, but it was good fun and we’re looking forward to some more battles.